What does the iPad mean for internet video? By now you’ve heard about Apple’s newest product, the iPad. Steve Jobs calls it “magical” and “revolutionary.” Apple stocks fell dramatically upon its announcement. It is sleek. It is familiar. It will be popular, if for no other reason than the media will convince everyone it is (kind of like Twitter). Whatever you think about this new iPod Touch XL, it has people talking. 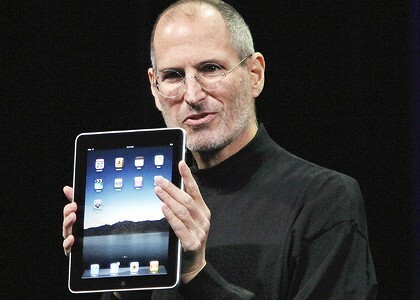 It seems some people pay no attention to any technology unless Steve Jobs shows it at Macworld. I heard someone on the radio express how wonderful Apple’s idea was to make a device that allows you to carry lots of books around with you; it was as if the last two years, the Amazon Kindle, Barnes & Noble Nook, and Sony e-Reader never existed. And that’s how powerful Apple has become. The innovation of an entire global industry is ignored, but when Apple introduces their version the whole American media world acts like Steve Jobs descended from Mount Sinai. All this as an introduction simply to suggest the iPad will undoubtedly create another cottage industry dedicated to iPad apps. Apple locks everything down so much it’s unlikely they will allow much competition with their own iTunes store (prediction: antitrust lawsuit in Europe), but many people will find new ways to use the portable video screen to access their entertainment. Even though the claim by Apple about the iPad is “The best way to experience the web,” the lack of support for Adobe Flash and Microsoft SIlverlight does cripple the browser from accessing several sources of video, it’s more than likely apps will be made for specific services. iTunes is a direct competitor with Amazon Video On Demand and Vudu, but Netflix’s subscription service may make the cut. Maybe one of these days Apple will allow a Pandora app. But apps aside (it is all speculation after all), how will this device be used to enjoy TV shows and movies? The iTunes store will of course allow rentals and purchases, but will people take a 10-inch tablet with them on the Subway to watch last night’s Colbert Report, or will they stick with the iPhone? The dock for the iPad is on the bottom edge, meaning docking the screen leaves it in portrait mode, so how will one watch wide-screen TV? The screen’s aspect is somewhere between 4:3 and 16:10 when in landscape mode, but there is no kickstand or dock (yet) for hand’s free use. Are we expected to always hold this device? Like the iPod, the iPad is a breeding ground for accessories. Finally, most home automation and entertainment control companies offer iPhone/iPod Touch apps to allow control of your home system on your portable device; Control4, Crestron, AMX, Speakercraft, Savant, and more all offer apps in the iTunes store. These apps should work immediately on the iPad without changing a thing. New apps will undoubtedly be created to utilize the larger display. This is probably the most exciting use for the iPad that I can think of, though a $499 10-inch touch panel seems unfair when a Control4 7-inch panel is $2,499. It’s nothing like Samsung’s prototype panel, but the multiple uses the iPad has can certain advantages. The breeding ground for accessories has already produced offspring. The Kindle and Nook both have free 3G, and can play audio files. But I doubt anyone wants to lug around a 10″ iPod for music anyway. eReaders do still have an advantage of being easy on the eyes while reading text, and being readable outdoors. I love the idea of a tablet PC. Unfortunately for my own personal use, a large iPod Touch isn’t the same thing. I admit, I have not been on that webpage in a long time… however it was another joy to see It is such an fundamental topic and ignored by so many, even professionals. I thank you to support making people more aware of doable issues.